Smoker Wood Chips, Wood Chunks, or Wood Pellets? Choosing between different types of wood chips and sizes can be overwhelming if you haven't smoked meat before. There are over 30 types of wood and 4 commercially available sizes of wood you can use with your smoker or grill. These 4 sizes come in the form of chips, chunks, pellets, and discs and are all used for different purposes when smoking meats. The main difference when comparing these sizes are the amount of time they will smoke and smolder during your grilling process. Wood Pellets: Wood pellets come in small pea or rod sizes. They are great for adding a quick smoky flavor to any small piece of meat that you are grilling. You can use wood pellets for smoking, but you will constantly have to replace the wood pellets and it will be hard to keep a continuous smoky flavor throughout the cooking process. However, wood pellets are most often used for chicken breasts or wings, steaks, or pork chops. Wood Chips: Wood chips are about the size of a large coin and the most popular of the three sizes. Chips are most often used for smoking small cuts of meat or fish. They are not an ideal size for long smoking sessions because they burn out and do not last as long as wood chunks. 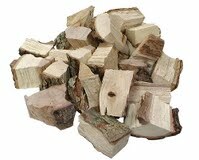 Wood Chunks: Wood chunks are the largest of the 3 sizes of smoker wood and are ideal for smoking large cuts of meat. Whole poultry birds, beef ribs, brisket, pulled pork, and other large cuts of meat are perfect for wood chunks. Wood chunks sometimes come with the bark still on, which imparts a rich smoky flavor that you can't replicate with chips or pellets. Wood Discs: Wood pucks are typically made of compressed saw dust. They are an eco-friendly way to purchase smoker wood that is made of leftover materials at saw mills. Some companies even have custom designed smokers that are made to feed a number of these through a sleeve in order to keep feeding smoke into the chamber. Another common question asked about BBQ wood chips is how to use them in your smoker during the cooking process. The answer to that may be fairly simple, but there are different ways to incorporate them into your smoker. Many BBQ enthusiasts encourage you to soak your wood chips between 1 to 2 hours prior to using them. The logic behind this is it will prevent your wood chips from flaring up and burning out quickly. You can soak your chips in any type of liquid you want ranging from beer to apple juice to just plain water. Other professional smokers say the wood doesn't soak up the liquid so this is just an extra step you don't need to worry about. Our recommendation here at Grill Smoke BBQ is that you should soak your wood chips, but not your wood chunks or pellets. The reason why we like to soak our wood chips is because they quickly burn and you have to constantly add more wood about every hour. Wood chunks, however, are large enough so they do not burn away quickly. And, pellets are actually made of wood dust that is tightly compacted together so it won't soak up any liquid. Most smokers will agree using a smoker box or a wood chips packet is beneficial to the cooking process. These devices have holes in the top that allows the smoke to rise out and flavor the meat. They also keep the heat of the charcoal away from direct contact with the wood and allows the wood to smoke for a longer period of time. These devices are perfect for using wood chips, but wood chunks or pellets can be applied directly on your heat source with no problem. Wood Chip Smoker Box: Wood smoker boxes are available in most barbecue sections in your local hardware or specialty BBQ store. These are typically made of metal and can last a few years if you do not leave them outside to rust after you finish smoking your meat. 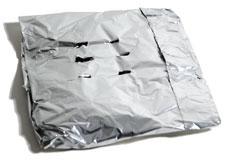 Foil Wood Chips Packet: A foil wood chips packet is a cheap and quick way to accomplish the same thing as a box. They can are made by wrapping a couple layers of aluminum foil in a pouch and dropping your wood chips in. Simply poke holes in the top of the pouch and you are good to throw it on the smoker. You may need to make 2 or 3 of these wood chip pouches depending how long you are planning on smoking your meat.